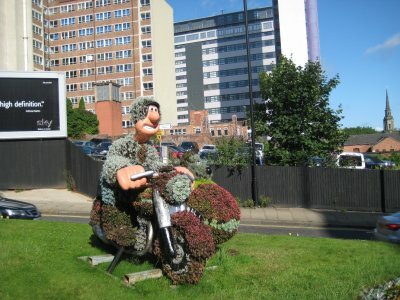 Walking to work in Birmingham every day in Birmingham, I pass a motorbike with side car that is sitting up on a traffic island on a busy motorway. A man with a large nose is driving the motorcycle, and his dog sits in the side car, looking awfully scared. Wallace and Gromit are the main characters in a series of claymation programs and an academy award winning movie. Wallace is the man, an unsuccessful inventor from outside Manchester. His dog, Gromit, is the smarter of the two, and often keeps his master Wallace out of trouble. 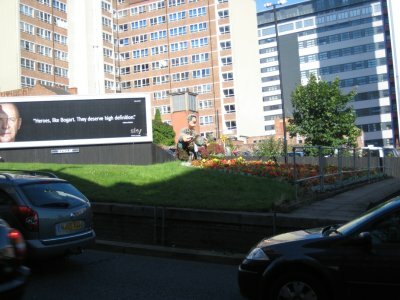 Why, though, are they parked up on a traffic island above a tunnel entrance in Birmingham? 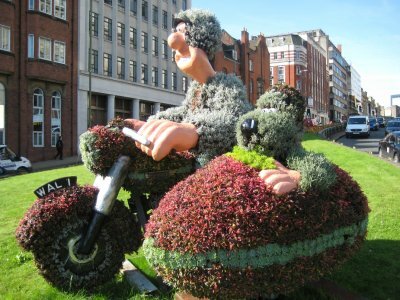 According to the BBC, "poised on a motorbike and side carriage on Great Charles Street, Wallace and Gromit are welcoming anyone coming into the city via the Queensway tunnel. 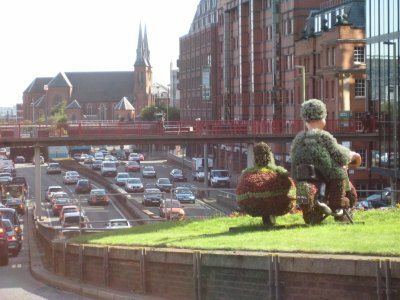 Made out of over 10,000 individual plants on two meter high fibreglass frames, the duo are part of the City Centre Floral Trail, Birmingham's entry into the National Britain is Bloom competition." Given the traffic along Queensway most days, hopefully they give the motorists a little smile and perhaps reduce the road rage level just a touch. If nothing else, they give me a smile most mornings.